Could cancer be a metabolic disease? Many people view cancer as unpredictable – that some people are just “unlucky”, and it’s largely random who gets diagnosed. It’s not surprising, given the prevailing view among medical professionals that cancer is first and foremost a genetic disease. But emerging evidence suggests that the primary driver of cancer is not genetic mutations, but dysfunctional cell metabolism. This means that once again, our genes are not our destiny, and that treating the root cause of disease has the potential to enhance cancer treatment or prevent its occurrence in the first place. 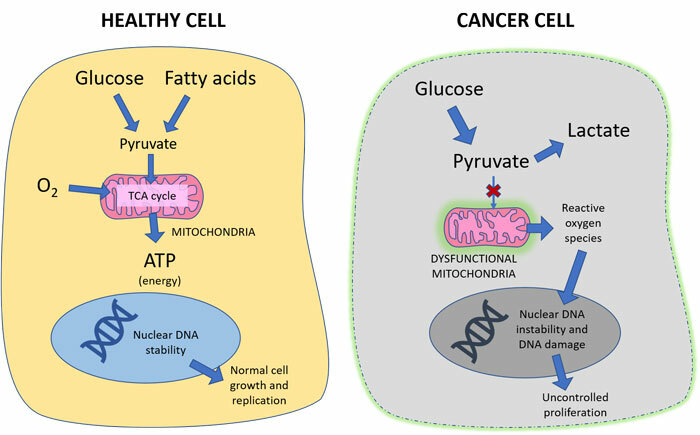 In this article, I’ll discuss the evidence for the metabolic theory of cancer and how to put this into practice to help prevent and treat cancer. For a long time, cancer has been viewed as a genetic disease. Somatic mutation theory holds that when DNA in the cell nucleus is replicated over many cell divisions, its prone to random mutations. Mutations in specific “driver genes”, like oncogenes or tumor suppressor genes, can lead to runaway cellular proliferation and malignancy. This, in turn, can result in abnormal cellular metabolism and will determine the characteristics of the tumor. But if cancer is a genetic disease, why do cancer rates continue to climb higher every year? We share most our genes with our hunter-gatherer ancestors and virtually all of our genes with our grandparents and great-grandparents, yet it seems that cancer becomes more prevalent with each successive generation and afflicts more and more young people. Moreover, traditional cultures are virtually free of cancer and other chronic diseases. It would seem as though there must be another factor. The most promising line of cancer research involves mitochondria. Mitochondria are tiny energy factories located inside just about every cell in your body. In healthy cells, they turn fuels like fat and carbs into energy that the cell can use. This process requires oxygen and is called aerobic metabolism. When they combined the cytoplasm of a malignant cell with a healthy nucleus, the cells became malignant and proliferated out of control. 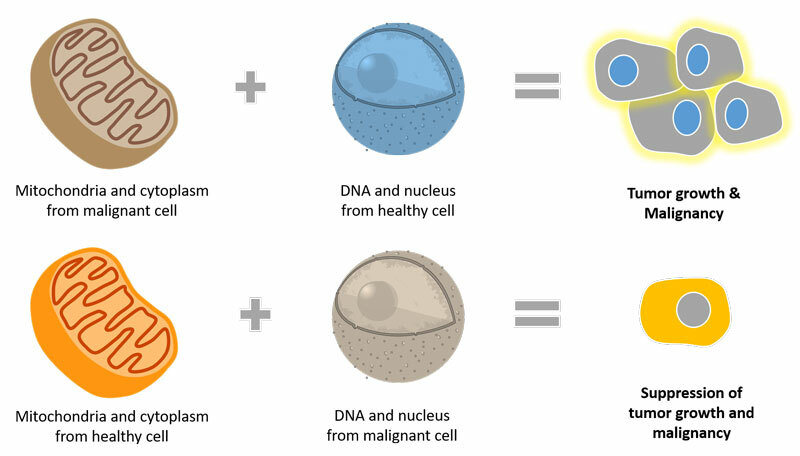 Injecting healthy cytoplasm into a cell with potentially cancerous mutations in the nucleus, however, did not result in tumor growth or malignancy. This is empowering. While genetics and aging are largely out of our control, the majority of these factors are modifiable. New mitochondria are formed regularly and can replace older, dysfunctional mitochondria if we make the necessary diet and lifestyle changes. In a moment, I’ll share the most important steps to improving your mitochondrial health. But first, I want to clarify the role of complementary treatment. Understandably, people feel desperate when they receive a cancer diagnosis. This can lead to a lot of self-directed research, where the lines between evidence-based therapies and unsubstantiated ones can easily be blurred. The result is a great deal of confusion over what complementary or alternative therapies actually have merit. However, if we rely on evidence, conventional and unconventional therapies do not have to be at odds. By bringing the best of both worlds together, we can improve the chances of achieving cancer remission and restoring optimal health. It’s my hope that in the rest of this article, I might help clarify where the evidence really lies, and how we can use our understanding of cancer as a metabolic disease to treat and prevent cancer. Note: I am not an oncologist. Diet and lifestyle are not a replacement for aggressive cancer treatment. They are intended to be complementary to conventional surgery, radiation, chemotherapy, or immunotherapy treatment, and should always be discussed with members of your care team. Any respectable healthcare provider will remain open-minded to complementary treatments that are evidence-based and do not interfere with the primary treatment. Cancer is a complex, multifactorial disease, and each person’s cancer has a distinct etiology and presentation. 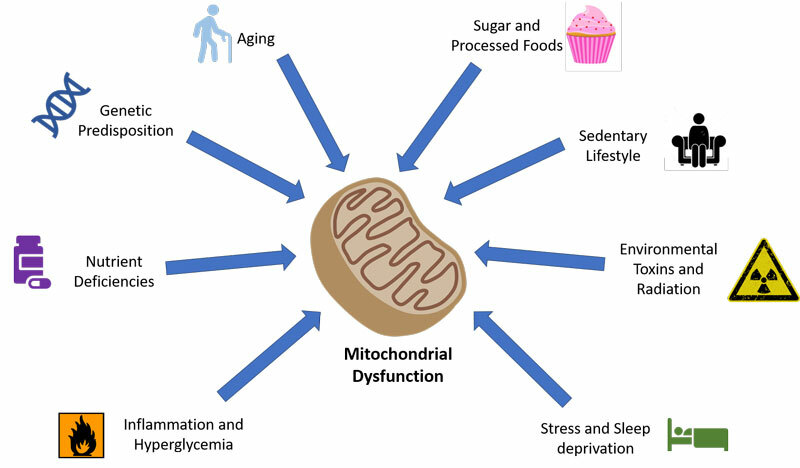 However, when combined with mainstream care, lifestyle changes can enhance the effectiveness of treatment, reduce adverse symptoms, and prevent cancer occurrence or recurrence by improving mitochondrial health. In other words, most cancers thrive on carbohydrates. By reducing carbohydrates in the diet and replacing them with healthy fats, you “starve” the cancer cells, while still feeding the healthy ones. Eliminating processed foods, grains, and sugar will also help reduce inflammation in the body and improve overall mitochondrial health. A 24 to 48 hour fast will typically kick the body into ketosis, but there’s another option: a ketogenic diet. A ketogenic diet is high in fat, very low in carbohydrates, and moderate in protein, so it mimics the metabolic physiology of fasting. In addition to mobilizing body fat, dietary fat will also be used to form ketones. Ketosis is a fantastic adjuvant therapy (combination therapy) for those undergoing chemotherapy and radiation. Note: Those with cancer cachexia and muscle wasting should be cautious about entering ketosis, as it is a catabolic state and may cause weight loss. Soap, shampoo, and makeup: Parabens are a known carcinogen. One study found that 99% of breast cancer tissues had parabens in them.12 Sodium lauryl sulfate, fragrance, and synthetic colors are also ingredients to be wary of. Synthetic parfum/fragrances: contain dangerous phthalates, benzene derivatives, and other potential carcinogens. Try instead: An all-in-one natural soap and shampoo bar. My favorite is Ancient Minerals Zion Clay Soap. Toothpaste: Fluoride is a known neurotoxin and carcinogen. Some toothpastes contain Triclosan, a potential carcinogen, neurotoxin, and endocrine disruptor. Paraffin Candles: Candles made with paraffin wax create highly toxic gases like benzenes and toluenes when burned. Mice exposed to these vapors have been shown to exhibit liver and kidney abnormalities.13 Scented candles also often have wicks that contain heavy metals and artificial scents and dyes which can also release chemicals into the air. Household cleaners: Corporate advertising has tried to convince us that we need multiple different products to clean different surfaces. Most synthetic cleaners feature warning signs that they are toxic, corrosive, or poisonous, yet we continue to use these around ourselves and our kids. Laundry detergent: Common ingredients like 1,4-dioxane, nonylphenol ethoxylate, and synthetic colors are all potential carcinogens. Pollution: Indoor and outdoor air can contain carcinogenic compounds, and water can contain heavy metals like arsenic. The solution: Get an air filter and a charcoal-based water filter for your home. Buy furniture gently used or look for furniture without flame retardants. The solution: Familiarize yourself with the Dirty Dozen list and buy organic products whenever possible. Better yet, go to the farmers market and meet local farmers who can tell you about their growing practices. Plastic. Plasticizers like BPA can cause endocrine disruption, reproductive issues, and cancer. Even “BPA-free” plastics are full of alternative plasticizers that may be worse than BPA itself. Instead: Invest in a stainless steel water bottle, and when possible, buy food that is not wrapped in plastic. Cookware: Non-stick cookware has a synthetic coating of polytetrafluoroethylene (also known as Teflon). This plastic polymer has been shown by the EWG to release toxic gases at high heats. Instead: opt for stainless steel, cast iron, or safe ceramic cookware. This list might seem overwhelming, but it’s only because of the ubiquity of carcinogens in our modern world. If you can just commit an hour to getting these out of your house, and an hour replacing them with healthier alternatives, your mitochondria will thank you in the long-term! *Note: I have no affiliation with any of these companies or products. These are simply what I use in my home, after trying out many different natural products. Our circadian rhythm is a 24-hour clock that governs our wakefulness and sleep patterns, and is determined primarily by our exposure to light. Mitochondria have a circadian clock of their own, which is thought to be influenced by nutrient availability (in other words, the times at which we eat).21,22 Periodic fasting, adequate sleep, and entraining circadian rhythms allows the mitochondria to repair themselves. Note: It is important to disclose any supplements with your oncologist to assess potential interaction with chemotherapy treatments. Some botanical supplements show promising immunomodulatory effects in preclinical studies, increasing tumor rejection or pathogen resistance. In a large, double-blind, placebo-controlled trial, Wisconsin ginseng was well tolerated and effective in improving fatigue outcomes in cancer survivors.26 However, some botanical treatments are potent and, if used improperly, can cause liver toxicity and liver failure. The evidence regarding dietary supplements and antioxidants during chemotherapy or radiation treatment is mixed. Some doctors believe that antioxidant support can help offset the toxicity of treatment on healthy cells. Others believe that antioxidant support might reduce the ability of chemotherapy drugs to kill off cancer cells. General supplements to support mitochondrial health include CoQ10, magnesium, vitamin C, selenium, and L-carnitine. As the metabolic theory of cancer gains more traction, I hope to see more controlled studies on the long-term efficacy of these supplemental nutrients in cancer treatment. In general, nutritional supplements should always be considered in the context of the patient’s nutritional status, the particular cancer you are dealing with, and the primary treatment agents. That’s all for now. If you found this helpful, I’d love to hear about it. Click here to subscribe or get a free phone consultation with me. Israel, B. A. & Schaeffer, W. I. Cytoplasmic suppression of malignancy. In Vitro Cell. Dev. Biol. 23, 627–632 (1987). Shay, J. W. & Werbin, H. Cytoplasmic suppression of tumorigenicity in reconstructed mouse cells. Cancer Res. 48, 830–833 (1988). Anand, P. et al. Cancer is a Preventable Disease that Requires Major Lifestyle Changes. Pharm Res 25, 2097–2116 (2008). Fine, E. J., Miller, A., Quadros, E. V., Sequeira, J. M. & Feinman, R. D. Acetoacetate reduces growth and ATP concentration in cancer cell lines which over-express uncoupling protein 2. Cancer Cell International 9, 14 (2009). Lee, C. et al. Fasting cycles retard growth of tumors and sensitize a range of cancer cell types to chemotherapy. Sci Transl Med 4, 124ra27 (2012). Maalouf, M., Sullivan, P. G., Davis, L., Kim, D. Y. & Rho, J. M. Ketones inhibit mitochondrial production of reactive oxygen species production following glutamate excitotoxicity by increasing NADH oxidation. Neuroscience 145, 256–264 (2007). Barr, L., Metaxas, G., Harbach, C. a. J., Savoy, L. A. & Darbre, P. D. Measurement of paraben concentrations in human breast tissue at serial locations across the breast from axilla to sternum. J. Appl. Toxicol. 32, 219–232 (2012). Ketan, V. K., Bhavyata, K., Linzbuoy, G. & Hyacinth, H. N. Renal and hepatotoxic alterations in adult mice on inhalation of specific mixture of organic solvents. Toxicol Ind Health 31, 1158–1164 (2015). Cogliano, V. J. et al. Preventable Exposures Associated With Human Cancers. J Natl Cancer Inst 103, 1827–1839 (2011). Guyton, K. Z. et al. Carcinogenicity of tetrachlorvinphos, parathion, malathion, diazinon, and glyphosate. The Lancet Oncology 16, 490–491 (2015). Ward, M. H. Too Much of a Good Thing? Nitrate from Nitrogen Fertilizers and Cancer. Rev Environ Health 24, 357–363 (2009). Menshikova, E. V. et al. Effects of Exercise on Mitochondrial Content and Function in Aging Human Skeletal Muscle. J Gerontol A Biol Sci Med Sci 61, 534–540 (2006). Mustian, K. M., Sprod, L. K., Janelsins, M., Peppone, L. J. & Mohile, S. Exercise Recommendations for Cancer-Related Fatigue, Cognitive Impairment, Sleep problems, Depression, Pain, Anxiety, and Physical Dysfunction: A Review. Oncol Hematol Rev 8, 81–88 (2012). Wrede, J. E. et al. Mitochondrial DNA Copy Number in Sleep Duration Discordant Monozygotic Twins. Sleep 38, 1655–1658 (2015). Lacedonia, D. et al. Mitochondrial DNA alteration in obstructive sleep apnea. Respir Res 16, (2015). Manella, G. & Asher, G. The Circadian Nature of Mitochondrial Biology. Front Endocrinol (Lausanne) 7, (2016). Neufeld-Cohen, A. et al. Circadian control of oscillations in mitochondrial rate-limiting enzymes and nutrient utilization by PERIOD proteins. PNAS 113, E1673–E1682 (2016). Lau, C. H. Y. et al. Acupuncture and Related Therapies for Symptom Management in Palliative Cancer Care. Medicine (Baltimore) 95, (2016). Lengacher, C. A. et al. Influence of Mindfulness-Based Stress Reduction (MBSR) on Telomerase Activity in Women With Breast Cancer (BC). Biological Research For Nursing 16, 438–447 (2014). Barton, D. L. et al. Wisconsin Ginseng (Panax quinquefolius) to improve cancer-related fatigue: a randomized, double-blind trial, N07C2. J. Natl. Cancer Inst. 105, 1230–1238 (2013).